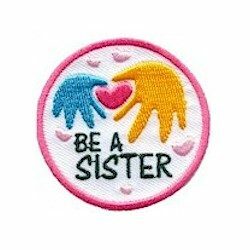 Commemorate the day of helping a younger group of girls earn their patches with a Be a Sister patch. 12 reviews for "Be A Sister Patch"
patches as expected but shipping cost was high for small patches! love this patch!! it was easy to get on uniform held nicely, and beautiful colors!! The patches at makingfriends.com are always colorful and fun. They are well made and they stand the test of time. Price is always unbeatable. All the patches I ordered were exactly like pictured. Very happy with the quality and speed of delivery. 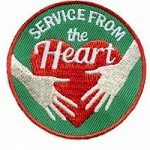 We ordered this patch to give to our sister girl scout troop. The older girls loved it. The colors were good and the quality was spot on! So glad to find these for our Jr Bronze award event that involved holding an event for area Daisies to earn their Violet (Be a Sister to Every Girl Scout) petal. The girls – Jrs & Daisies – were thrilled with them! Thanks! The sister patches I ordered arrived a lot sooner that I thought!! They look great!! They are so cute and colorful and a great value!! I got this for both my Daisies and Brownies, the girls loved it! I got these fun patches for my Brownie troop when they helped me out with a Daisy troop activity. The only downside is the patches are not iron-on. Otherwise, they are very pretty and the girls loved them! They are very cute….. a great buy. Love this patch. It is pretty, well made and goes well for our Daisy who has already earned the Be a Sister to Every Scout petal. Fast shipping as always. Cost of shipping was more than the patch but it was because I only had two patches to order.